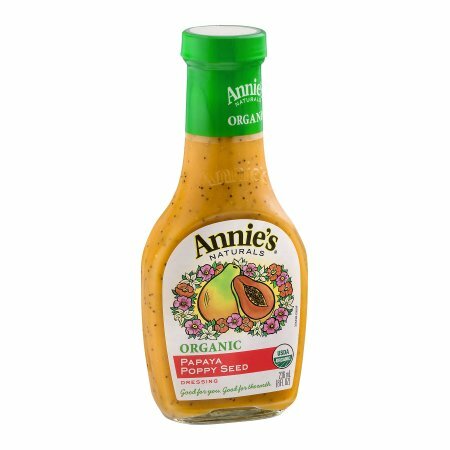 BY FAR, my favorite salad dressing is Annie’s Organic Papaya Poppy Seed Dressing! It is simply AMAZING! I never leave a DROP on my plate! Unfortunately, the only place I can find this flavor is at Whole Foods. But it’s always there. I see Target, Amazon, and Walmart sell it online. SO SO GOOD. I love Ranch too, but I can’t eat it at home. Bottled and make-your-own have MSG in it. A big no go for me. Some restaurant brands are fine, though. Nope, Annie’s Papaya Poppy Seed is the one for me. yum yum yum! So what are your favorite salad dressings? I do love Caesar salad dressing too. And a good Roquefort. This entry was posted in Uncategorized and tagged salad dressing on June 26, 2018 by Silver Willow. Welcome Carol…and hope you find the salad dressing AND like it! Yes, I wouldn't expect it to be available down there. Sorry!